We are using chemical and physical principles to study the molecular events underlying the development and design of pharmaceutics and their formulations. Current research activities in our lab have the following focus. The physical-chemical properties of organic drug molecules will influence the way by which they interact with or can diffuse over cellular membranes. Detailed computational studies of such transport processes can potentially lead to an understanding about the kinetics and thermodynamics involved thereby helping us to better predict the bioavailability of drugs. 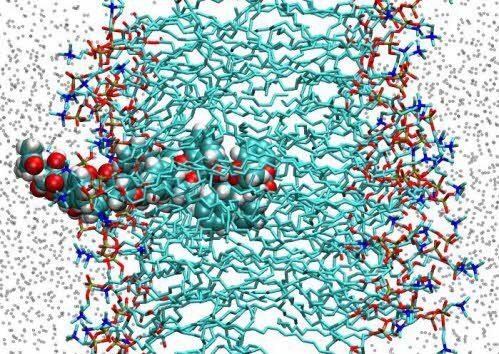 In a recent example, the passive diffusion of the oral anticoagulant drug warfarin across a phospholipid bilayer membrane was investigated through the use of molecular dynamics simulations. In solution warfarin exists as a distribution of isomers which population is influenced by the polarity of the molecular environment. Results from performed dynamics simulations could propose a mechanism for how warfarin passively can be transport across membranes but also what isomeric forms that are active and thereby also explaining regulatory aspects of the bioavailability of this important anticoagulant drug, Figures 1a and 1b. Figure 1b. Membrane Permeation of Warfarin. Characterization of the nature and extent of drug-protein interactions that are underlying the molecular recognition phenomenon. Furthermore, biomimetic recognition systems based on synthetic organic polymeric receptors known as molecularly imprinted polymers (MIPs), are also studied in order to explain the origin of the predetermined molecular memory that is demonstrated by these materials. MIPs have previously been prepared to demonstrate recognition for a range of pharmaceutically interesting compounds such as the local anesthetic drug bupivacaine, the non-steroidal anti-inflammatory drug naproxen and the anticoagulant drug warfarin and can be used as solid matrices in separation science or as recognition element in sensing devices. 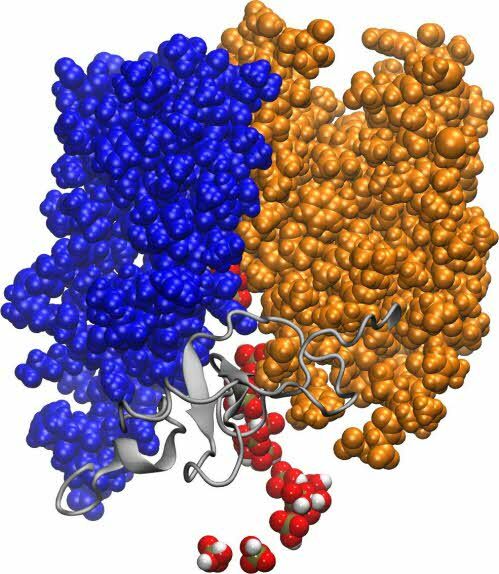 The structure and dynamics of membrane proteins is of interest by us in order to understand cellular transport of nutrients and its consequences for biological function. Understanding the molecular mechanisms governing the transport process will potentially help in the development of drugs that can regulate their function. A combination of theoretical and experimental techniques was recently used to investigate the functional role of Tyr179 in the H+-coupled Saccharomyces cerevisiae Pho84 high-affinity phosphate transporter. Here, studies using the open inward-facing conformation of the protein and models using various protonated states of an amino acid positioned in the release pathway, Asp178 revealed that a protonation of this residue resulted in a conformational change of Pho84 hence suggesting the role of proton transfer in Pho84 for regulating the phosphate transport, Figure 2. Finally, studies concerning general principles and laws of physical chemistry are currently being performed in the laboratory. In on-going studies, attention is directed on how the molecular structure of volatile organic compounds will influence their solvation behavior and evaporation from non-ideal liquid mixtures. Results from these studies will not only be of general interest for all molecular sciences but also important factors that play role for how we develop liquid drug formulations. 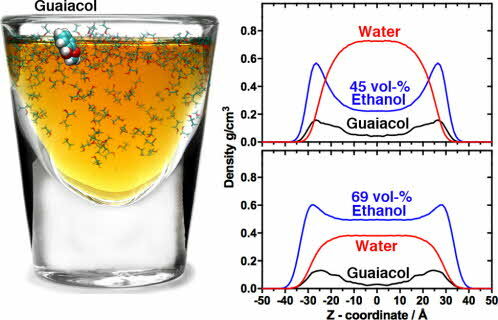 In one recent example we used computer simulations of a series of liquid water-ethanol mixtures containing the phenolic compound guaiacol. This compound is known to contribute to the smoky, peaty, taste and smell of single malt Scotch whisky but is also an excipient in drug formulations and used in combination with codeine (e.g. Pulmo Bailly(R) Cough Expectorant). Results from these studies suggested that adding water to such mixtures give raise to change in the distribution of guaiacol from the bulk to the air-liquid interface of such mixtures, Figure 3. These results were used to give support to the claim that adding water to Scotch whisky can improve the taste and smell of the whisky. It should be noted, however, that the findings are of a more general importance. Drug molecules are frequently dissolved in water-ethanol mixtures and an understanding of the physical characteristics of such mixtures will aid in the development of drug formulation, but also have consequences for drug administration. The Physical Pharmacy Laboratory is part of the Department of Chemistry and Biomedical Sciences and Linnaeus University Centre for Biomaterials Chemistry. Assistant professor Thomas Näsström was awarded SEK 50 000 from Demensfonden for our joint project “The role of drugs on the aggregation of α-Synuclein – Implications for the development of Parkinson’s Disease and Dementia with Lewy Bodies”. As an invited speaker, Björn Karlsson gave an impulse lecture at the 20th Conference 'Odour and Emissions of Plastic Materials' in Kassel, Germany. The topic of his talk was molecular perspectives on the dilution of whisky, data that recently was published in Scientific Reports. Erum Farooq has previously graduated with a degree of Master of Science in Pharmaceutical Chemistry from the Federal Urdu University of Arts, Science and Technology, Pakistan. As a step to increase her competence in using computational pharmaceutical chemistry she will now, during the time-frame of a 30 credit course, undertake an individual research project in our laboratory. The focus of her research will be to solve problems where solubility and membrane permeability limit the bioavailability of small organic drug molecules. The preliminary thesis title is: Molecular dynamics studies on phospholipid membrane permeability of poorly soluble anti-malarial drugs. On 17 August, researchers Björn Karlsson and Ran Friedman published the article Dilution of whisky – the molecular perspective online at Scientific Reports (SR), the world's biggest mega journal. Their article attracted great and immediate international attention. Accordning to SR's statistics, it ranked 1st among over 3 000 articles of a similar age in SR and has so far been published by 122 news outlets and tweeted by 933 – BBC News, Washington Post and CNN to mention just three. The news page at Lnu.se has had 3,000 Swedish and over 70,000 international visitors. Saik Ann Ooi graduated with a Bachelor in Science (Pharmaceutical Chemistry) from International Medical University, Malaysia. She studied the stability of commercially available tablets using high performance liquid chromatography (HPLC) for her degree's dissertation. Now Ann pursues to further her knowledge by having a Master in Chemistry. She focuses on learning computational and experimental techniques in Structural Biochemistry, where she will work on membrane proteins. At present, she's beginning her degree project. Researchers within the Centre for Biomaterials Chemistry recently arranged and participated in a workshop focused on the use of Rosetta, a software developed for protein engineering. The workshop took place 5-6 April at Ekerum, Öland.